Tell us your tried and true techniques for focusing when that deadline looms and you need to get work done. In other words, how do you avoid wasted days and wasted nights? As I’ve aged, being able to focus has felt like the last rung of a ladder just out of reach when the sand monster is chomping at your feet. You know that if you could just extend the reach an inch farther, you could get it done. One of my mentors, Victoria, always appeared to be on task, very productive; regardless of the fact that all others around her might be losing their minds. There were many late afternoons when I was a student, and then an employee; I would find Victoria squirreled away in her office. Tucked behind piles of things, she was always busy: writing, filing, typing, reviewing, putting things into scrapbooks. Her office wasn’t big. It was lined with bookshelves and two and four-drawer file cabinets, and a desk of course. The tight space was never messy, at least not by my standards. Piles, sure, but everything had a spot and everything was in a spot. One of the things I learned from her particularly when it came to meeting deadlines, was to clean up before you start. In other words, when a project was finished, be done with it. File the papers, put the boxes back where they belong, make the new list of tasks and move on. 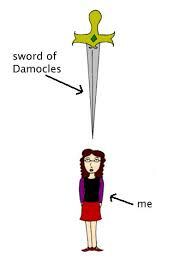 I find that when meeting a deadline is like the sword of Damocles over my head, I stop, look around my space, and I put things back where they belong. The un-filed folders that have stacked up as people come in and out of my office for a “quick question”, find their way back into the drawer. The recycling bin gets put next to the door so it can be easily emptied by the custodian. Pens and pencils are returned to the plastic drawer container on my desk, and the hundred little post-its are put into and envelope in my desk for when I need them in the future. And, I clean out the coffee cup that I’ve forgotten to take down to the kitchen for three days finally gets washed. Today I thank Victoria for yet another lesson on how to be successful at work and in life. Thanks, VA! Boredom! Wasted Time! If only… Daily Prompt | ALIEN AURA’S BLOG: IT’LL BLOW YOUR MIND! Phoenix Nights | Views Splash! Meeting a deadline is the best thing we can do,but sometimes it can be difficult.